Three months after typhoon Haiyan hit the Philippines last November 8, 2013, Mr. John Nduna, ACT Alliance General Secretary is in the country to visit the typhoon affected areas. From February 9 to 14, 2014, Mr. Nduna had a series of meetings with ACT Alliance members and visited communities supported by ACT Alliance. He was accompanied by Mr. Sudhanshu Singh, the Senior Programme Officer for Asia/Pacific and Humanitarian Response. Mr. Nduna had a brief meeting with the NCCP General Secretary, Rev. Rex RB. Reyes Jr. in the morning of February 10, 2014 before going to Tacloban. Upon arrival in Tacloban, he met with the ACT Philippine Forum members and visited the ACT members’ offices and was able to get updates on the on-going emergency response. 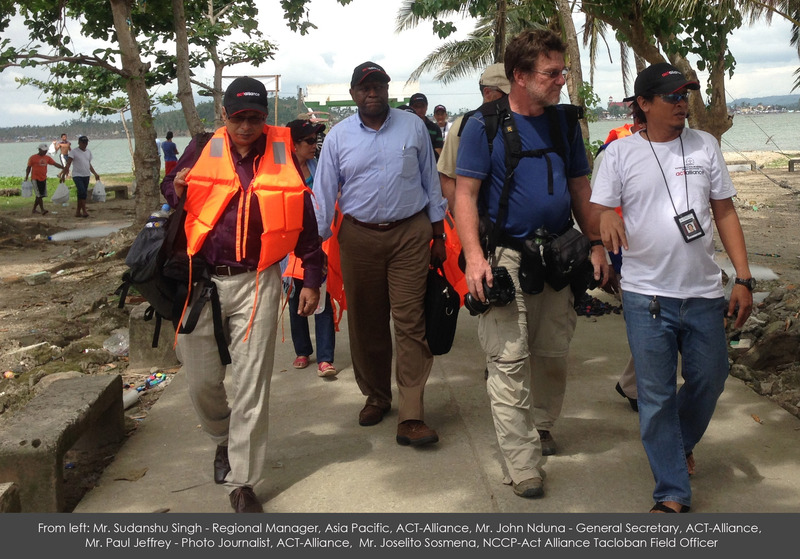 On February 11, Mr. Nduna met briefly with Mr. Andrew Martin, UN OCHA Tacloban Coordinator to formally introduce the ACT Alliance members and their work. They also discussed lines of coordination and how the participation of the NGO, local or international, can be strengthened. Following the meeting is visiting the communities where the ACT members are. In Basey, Western Samar he visited Barangay (or village)Bacobac which is the site of a Norwegian Church Aid (NCA) water, sanitation and hygiene (WASH) project. In Brgy. Salvacion, Jinamoc Island he was able to listen to the stories of families still living in tents while some community members were cutting coconut lumbers for the building of transitional shelters in the community as part of NCCP’s rehabilitation work in the area. In Tanauan Leyte, he visited the sites of the permanent housing project of the United Methodist Committee on Relief (UMCOR). There was also an ongoing distribution of water purification kits to families through UMCOR’s partner, the Global Medics. In Barangay Telegrafo in Tolosa, Leyte a community dialogue was organized by Alyansa Tigil Mina, the partner of Christian Aid. Community members shared the community situation as a result of the onslaught of Typhoon Haiyan. Plans for the recovery and rehabilitation were also shared. Mr. Nduna met with the Mayor of Ormoc City on February 12 before visiting other ACT Alliance partners’ cash for work project being undertaken by Lutheran World Relief and Christian Aid in two villages near Ormoc. He also visited the work of Lutheran World Relief shelter repair kits project being conducted in Daanbantayan, Cebu before returning to Manila on February 13. Mr Nduna and Mr. Singh concluded their time in the Philippines with meetings at the UN OCHA Manila office and a debriefing with the ACT Philippine Forum members on February 14. Mr John Nduna, in his opening remarks during his meeting with the ACT Alliance Philippine Forum members, shared an African proverb, “If you want to walk fast, walk alone. If you want to walk far, walk together”. The ACT Alliance is a remarkable cooperative effort of the churches working together to respond to human need in this critical time. The visit of Mr Nduna and Mr Singh has done a great deal to reinforce the cooperative efforts that are already well underway under the banner of the ACT Alliance.